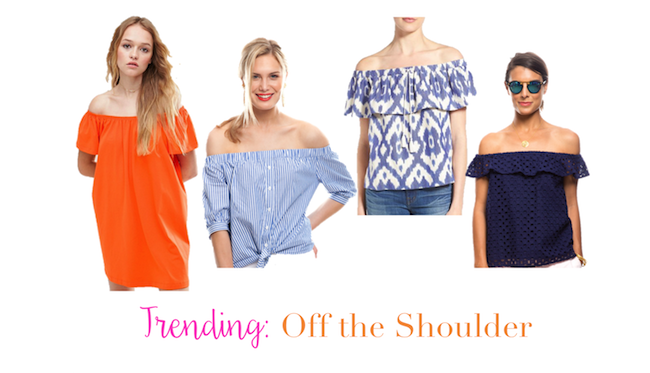 By now, you're probably aware that off the shoulder tops are allll the rage. If you don't have at least one in your closet, you're really missing out on this fun summer trend! They're effortless, chic and easy to wear for warm days when you want to stay cool. You can wear them a ton of different ways, but I especially love how the tops look with white jeans or distressed denim shorts paired with fun sandals or white tennies. Of course, having an off the shoulder dress is so fun for summer, too! There seem to be a ton of blue and white ones everywhere at the moment (aka the best color combo known to man) so I pulled a bunch of my favorites and have them all below! Are you loving off the shoulder styles as well? I've been loving the off the shoulder trend too. Problem is there are so many cute ones, I can't decide which one to buy! I absolutely love this trend. There are so many cute off the shoulder pieces, and I did a post similar to this! I definitely need to purchase an off the shoulder piece! Thank you so much for this! I have been loving off the shoulder pieces and have been on the lookout for the perfect one. You gave me a lot of great options! I love the off the shoulder trend! Old Navy had this really cute off the shoulder jean dress a few weeks ago, but it sold out in my size before I could get my hands on it.